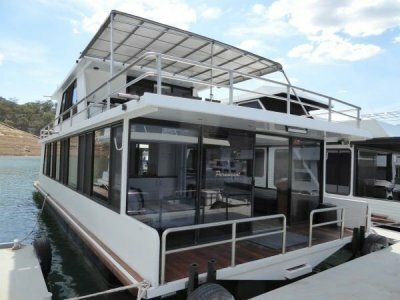 "Wicked" ; ; ; ; is about providing your family with a magnificent stylish and comfortable family holiday home on the water of Lake Eildon, where your family can create many great times together. Coming upto 5 years old, Wicked was quality built by Peter Raaymakers at the Houseboat Factory who takes immense pride in the standard of his work. 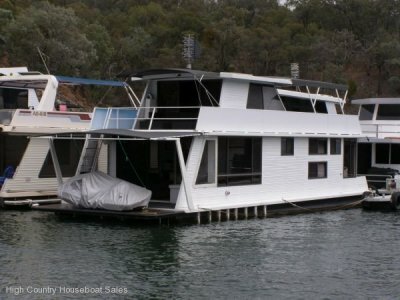 He has used all his experience in designing and building this state of the art houseboat. "Wicked" has been extremely well maintained ever since. At water level, innovative design caters for three good bedrooms, an excellent modern kitchen with the best of appliances, and an open spacious rear lounge featuring a gas log fire. The pluses include R/C air-conditioning, Fusion Media Player Sound Systems; Auto-satellite tracker; 5 TVs; Auto-Pilot; Hydraulic Rear & Side Duckboards, Side sliding opening door, plus, plus, plus. No matter what time of the year you will relax on Wicked. Then there is upstairs under the hardtop; this is something else; it provides an all year round entertainment / relaxation area with a magnificent layout. A full set of clear and fly wire screens give you all year round comfort, but the surprise is the retractable sun roof to let the sun and the moonlight & stars in. Then there is the remote helm; full kitchen; couches and outdoor dining setting; it looks fantastic. "Wicked" has the latest in technology with abundant solar panels, large batteries and large inverter/charger. It doesn't stop there with the new grey water treatment system and ballast tanks. The large twin motors together with the Bow & Rear Thrusters makes her so easy to manoeuvre. Then there are the hydraulic side boat boards. "Wicked" has it all. I could go on with superlatives about "Wicked", but the best way, if you are seeking a high quality luxury holiday home for your family to experience the magic of Lake Eildon in style and comfort is to make the time to come and inspect "Wicked". For More Detailed Information & Extra Photos Please Go To "Email The Seller For More Information. " 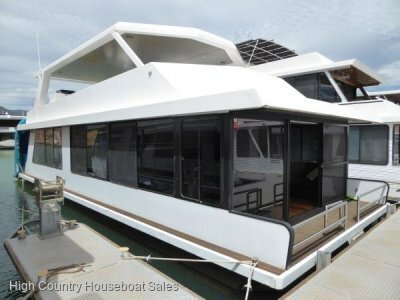 BR1: Queen sized walkaround bed; Front view; Wardrobe; Side & overhead cupboards; Underbed storage; Ceiling fan; TV Kogan; Direct bathroom access; Pontoon storage. Kitchen: Pantry; Westinghouse Oven, Grill, 5 burner bench Cooktop, Rangehood; LG electric Fridge / Freezer / Ice maker; Sanyo microwave oven; Fisher & Paykel dishwasher; Whirlpool electric Bar Fridge; Drinking Water filter tap; Servery x 2 stools. Kitchen: Westinghouse Oven, Grill, 5 burner bench Cooktop, Rangehood; Whirlpool electric bar fridges x 2; Fisher & Paykel dishwasher; Sanyo Microwave oven; Drinking Water filter tap; Simpson washing machine; Servery x 5 stools. POWER: Kohler 6kva Generator; Selectronic SP Pro Series Inverter/Charger; Exide Energy Store batteries 6 x 4RP2200N, 200amphrs; Plasmatronics PL60 Solar Charge Controller; Solar panels x 14; Mercruiser4.3lt MPI x 2; Motor start batteries x 2. 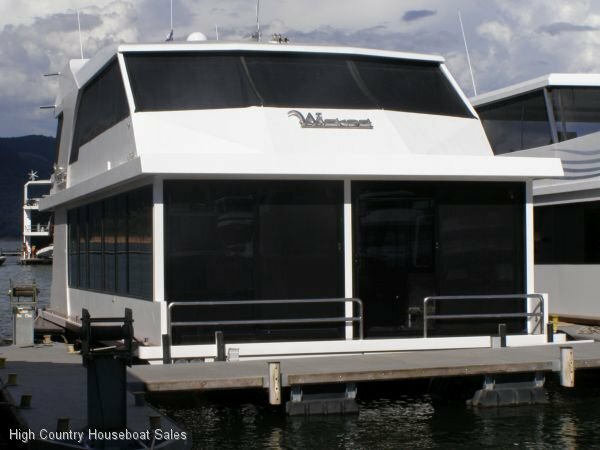 Bow & Rear Thrusters; Ducted Vacuuming System; Shade & Block Out Blinds throughout; Motion Sensor Night Lights.